Books → Poetry → North of California St.
About North of California St.
California St. is one of the major thoroughfares in downtown San Francisco, the city where George Stanley was born in 1934, and left at age 37 to move to Vancouver. 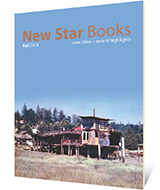 Associated with the "San Francisco Renaissance" in poetry, moving in circles that included Jack Spicer, Robert Duncan and Robin Blaser, Stanley had won a reputation as an exciting young poet. But it was his move to Canada, and particularly his fifteen years teaching literature at Northwest Community Collegein Terrace, BC that marked a profound turn in his poetic practice. North of California St. collects 53 poems, all written between 1975 and 1999, that mark Stanley's maturity as a poet. Originally published in four collections, all now out of print — Opening Day (1983), Temporarily (a chapbook; 1986), Gentle Northern Summer (1995) and At Andy's (2000) — the collection includes the Stanley classics "Mountains & Air," "Raft," "The Set," "The Berlin Wall," "For Prince George," "Terrace Landscapes," and the 16–part poem "San Francisco's Gone," including "Veracruz." Now retired from teaching in the English department at Capilano University, George Stanley is the author of eight books, including After Desire, Vancouver: A Poem, At Andy's, Gentle Northern Summer, Opening Day, The Stick, and You. Vancouver: A Poem was a finalist for the Dorothy Livesay Prize. In 2006, Stanley received the Shelley Memorial Award from the American Poetry Society.